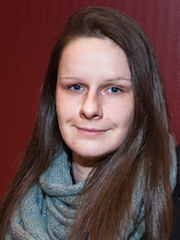 Wera Schmidt is PhD student in the International Research Training Group “StRATEGy” and graduates in the research group “Sedimentology” at the University of Potsdam under supervision of Prof. Dr. Maria Mutti and Prof. Dr. Claudia Galli. Her research focus is on the intrinsic and extrinsic control factors of sediment deposition of the Yacoraite Formation in the Tres Cruces subbasin of the Salta basin in NW Argentina. Petrographic and geochemical analysis are used to identify environmental parameters and assess diagenetic overprint to understand the spatial architecture of the sedimentary facies. Wera Schmidt is "StRATEGy" PhD speaker and in the PhD-Day organization committee at the University of Potsdam.